Miles (Paul Giamatti) has a plan to take his old college roommate Jack (Thomas Haden Church) on a trip to California wine country the week before his wedding. Miles, Jack's best man, wants the trip to be a relaxing one and wants to spend it tasting wines, golfing, enjoying fine dining, and simply hanging out with his soon-to-be married friend. Jack, however, has other plans, and wants to meet a random woman so he can have one last fling before taking the plunge. Nominated for five Academy Awards, Alexander Payne's "Sideways" is a smart, witty comedy about two middle-aged friends coming to a crossroads in their lives. Miles, played expertly by Paul Giamatti, is two years fresh out of a very painful divorce, has yet to begin dating, and is trying to get his novel published. His friend Jack, played by Thomas Haden Church, is about to get married, but seems to be getting cold feet. Jack is loaded with self confidence, and Miles is hugely insecure with a defeatist, destructive attitude. The two are polar opposites with virtually nothing in common, so it's a mystery as to why they are friends at all, and if they hadn't been college roommates at SDSU (!!! ), they probably wouldn't be so much as chummy. Miles and Jack are spending a week in California's wine country for Jack's "bachelor party," so because of this, there is a lot of discussion about wine in "Sideways." Much of life's complexities are broken down into wine metaphors that are surprisingly poignant. For example, "I like how wine continues to evolve, like if I opened a bottle of wine today it would taste different than if I'd opened it on any other day, because a bottle of wine is actually alive. And it's constantly evolving and gaining complexity. That is, until it peaks." BRILLIANT language, wouldn't you say? Such an impactful, excellent metaphor for the exact situation where Miles finds himself. 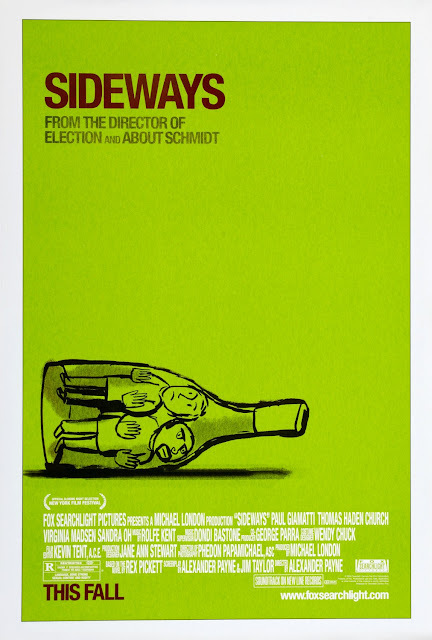 If anyone has ever questioned the cultural impact films might have on society, really, all you have to do is check out the spike in Pino Noir sales and dip in Merlot sales this film caused the year this film was released. Many mistook Miles' strong dislike of Merlot as a sign of inferior quality rather than what it actually was: simple personal preference. The reason "Sideways" works at all is because of the acting, which is nothing short of wonderful. Paul Giamatti was the perfect choice for Miles as he can wear both heartache and pain on his face extremely well. From the moment he hits the screen, you know exactly what his demeanor, his feelings, and his attitude towards life will be throughout the movie, even as he gives a more nuanced performance. Thomas Hayden Church is fabulous as well. Though we know what he's doing is totally wrong, Church still finds a way to be charming through his scummy doings. Church's low, sarcastic, surfer-dude voice lends a lot of humor to his character, enough though we're not supposed to like him. Church and Giamatti's characters might be polar opposites on screen, but they certainly have great chemistry. Each of the men has a love interest on their trip. Jack begins a fling with a young wine pourer and single mom named Stephanie, played by the criminally underused Sandra Oh, who Jack misleads into believing their relationship is more than just a fling. Oh is good with what little screen time she has, and we'd love to see her getting more work in films. Miles, on the other hand, begins a relationship a recently divorced waitress named Maya, played by Virginia Madsen. Unlike his friend Jack, Miles really cares about Maya and the two know each other from Miles' many trips to wine country. He wants to form a relationship with her, but Jack's actions with Maya's friend Stephanie could jeopardize any future coupling the pair may have. Giamatti and Madsen also have believable, palpable on screen chemistry and we totally believe them as a couple despite Miles' insecurities and his inability to receive any of the signs Maya throws at him. One thing about "Sideways" is it really makes us laugh every single time we watch it. Though it is a more mature film with adult situations, it's wholly engaging as both a comedy and a romantic drama. It has enough intimate, interesting conversations filled with deep, meaningful metaphors to keep you invested in its characters and situations from beginning to end. It's really no wonder this film took home the Oscar for best adapted screenplay. Give this one a try! One year ago, we were watching: "Bonnie and Clyde"